Select tomatoes which are a bit raw, firm & fleshy. Wash & dry tomatoes. Cut each tomato into eight pieces. Similarly cut all the tomatoes into pieces and take them into a dry bowl. Add turmeric powder and salt to the tomato pieces and mix well. While mixing squeeze the tomato pieces to make them soft and release some juice. Transfer the tomato pieces along with the juice to a ceramic or glass bowl and cover it. Keep the tomato bowl in a dry place for two days (48 hours). On the third day squeeze the tomato pieces and separate from the juice. Spread the squeezed tomato pieces in a plate. To the tomato juice, add tamarind and allow it to soak. Place the juice bowl and tomato pieces plate under sun and dry them. Cover the juice bowl with a slotted plate to avoid dust falling into it. Dry the tomato pieces till they turn crisp—this may take two or three days, depending upon solar intensity. When the tomato pieces are dried till crisp then we can start preparing the pickle. First we need to prepare fenugreek seeds powder. Heat a pan and add the fenugreek seeds and fry them. While frying the fenugreek seeds stir to fry evenly. Fry the seeds on low flame only to ensure even browning. If you feel the low flame heat is also high for the seeds taken, remove the pan in-between from heat and stir fry. The heat of the pan will be sufficient to roast the fenugreek seeds. A roasted seed when crushed with a heavy object, insides of the seed should appear evenly browned. Till you get the desired level fry the seeds stirring on low flame. Take a dry mixie jar and add the roasted fenugreek seeds and grind to make a fine powder. Squeeze and remove the tamarind from the juice. Spread the tamarind in a plate and remove the seeds and pith if any. Take the tamarind into a mixie jar and grind to smooth paste. If required add some juice for easy grinding of the tamarind. Add this tamarind paste to the juice and mix well. Now add the dried tomato pieces to the mixie jar and crush them coarsely—this coarse crushing adds some texture and taste to the pickle. Add this coarsely crushed tomato pieces to the juice and mix well. Now add the red chili powder and roasted fenugreek seeds powder to the juice and mix well. The pickle is ready for seasoning. Heat a pan and add oil to it. When oil is hot add the fenugreek seeds and mustard seeds and fry stirring. By the time the mustard seeds crackle fully fenugreek seeds change color. Then add the red chili pieces and asafoetida. Before the red chilies turn dark in color add the seasoning to the prepared pickle and mix well. Keep this pickle aside for two hours and then serve. The bitterness of the fenugreek seeds powder gets balanced with the tamarind-tomato juice and tastes better after two hours. Serve with plain hot rice and ghee. This pickle also tastes better when served with dosa, utappam, pesarattu, Curd rice etc. It tastes wonderful when spread on a toasted bread and served. Add salt depending upon the sourness of tamarind and tomatoes. Usually red and ripe tomatoes are less sour and should be avoided for pickling.. Similarly hybrid tomatoes are also less sour. In such cases salt may be adjusted. When using new tamarind (KOTTA CHINTAPANDU)—use less salt as new tamarind will be slightly sweeter when compared to the sour old tamarind. In any case first add half the quantity of salt mentioned and mix. Then taste the mixture and slowly add the remaining salt in intervals and mix. See that the tomatoes are dry of moisture after washing them so that the pickle stays for long period. Dry the tomatoes till they are crisp. At times when the sun is too hot dry the juice only for a reasonable period—otherwise all the juice evaporates and no moisture is left to make the pickle. If preparing this pickle in peak summer season, in warmer regions dry the tomato pieces till they are crisp and dry the juice for few hours only. Roasting the fenugreek seeds properly is very important. If the seeds are roasted on high or medium flame, they get browned very fast without getting roasted inside. So roast the seeds on low flame only. Constantly stir while roasting the seeds to ensure even browning of the seeds from inside too. Check the brownness of the seeds by crushing a seed—if the crushed seed appears brown as it appears on the outer surface that indicates the seeds are fried properly. When the seeds are not browned from inside and made into powder—the powder tastes bitter and the pickle will be spoiled. Please observe that there is only a very thin line between the roasted and burnt fenugreek seeds. Be careful !!! Use right amount of tamarind as tamarind is the preservative for this pickle. Adding more tamarind requires more salt and more chili powder. Depending upon the sourness of the tomatoes decide the quantity of tamarind. If the tomatoes are too sour add less amount of tamarind. 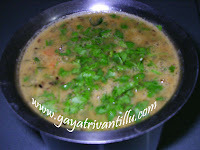 To test the sourness of tomatoes taste them or prepare tomato dal (PAPPU) and taste. Grind the sun dried tomato pieces COARSELY. Coarsely crushed tomatoes give texture and taste to the pickle. Seasoning gives a nice aroma to the pickle. The fried fenugreek seeds along with asafoetida give taste to the pickle. The taste of the seasoning vanishes as the pickle grows old. Add freshly prepared seasoning to the old pickle and serve—it will taste as new as if it is freshly made. While frying the mustard seeds ensure that heat of oil is proper to crackle all the mustard seeds. When mustard seeds are not fully cracked they taste bitter—if they are over fried also they taste bitter. As soon as all the mustard seeds get crackled add the seasoning to the pickle. The heat will be arrested when it comes in contact with the pickle and the mustard seeds will not get over fried. After adding the red chili pieces immediately add asafoetida and switch off the flame. Stir for few seconds and before the red chili pieces turn dark add the seasoning to the pickle. When red chili pieces turn dark in color, they give a burnt taste to the seasoning. As tomatoes are available throughout the year make this pickle in small quantities to enjoy the fresh taste. These small points which when often neglected spoils’ the taste of the pickle. Hope these points are of some help while making this tasty pickle. Naa peru Madhavi. Mee recipes anni chaala baaguntaayi.Naadi oka request. Meeru mee recipes loni ingredients anni gms lo measurement chepthunnaru. Cups, teaspoons and table spoons lo chepthe maaku veelu ga untundi ani naa abhipraayam. Gayatri garu mee vantalu chala bavuntai thanks thanks alot. 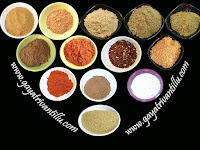 north indian receipes mariyu snac items receipes cheandi. Iam jayasree. Iam from vishakhapatnam. Now iam in boston along with my husband. I like your site veryyyyyyyyyyyyy much. I watched almost all ur recipe videos. Thye are sooooooooo good. I tried few recipes and they are very tasty. Here is a small request for u if possible add some videos related to kottimeera like kottimeera chutney, rice,karam and pachadi like.